Smartie McFurry, Clown Puke, confetti in snow, take your pick! 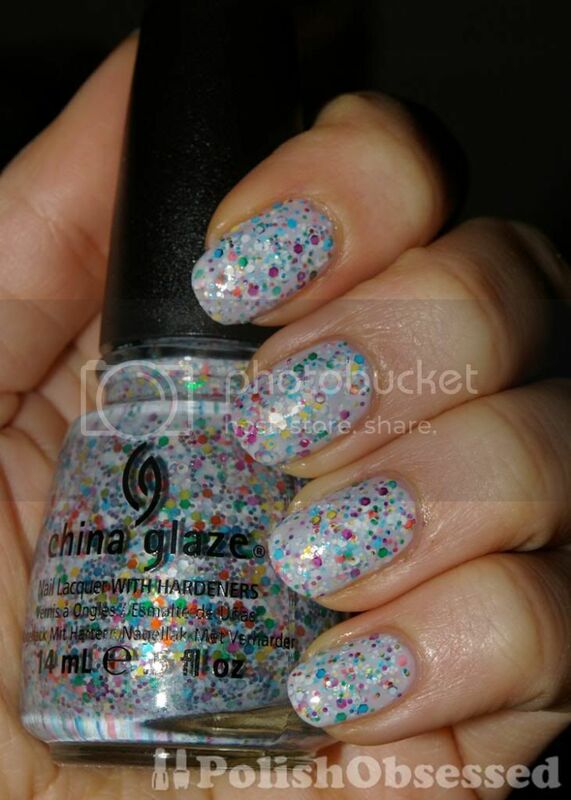 China Glaze It's a Trap-eze is totally awesome! I have been wearing it for the past four days and do not want to take it off, it is such a fun polish. The glitter ranges from green, blue, magenta, orange/red yellow and silver medium and small hex glitter. All this glitter is in a milky off-white jelly-ish base. The key to getting this polish to look great is application. First you should make sure that the polish is all shook up and the glitter is mixed up well, then apply thin coats with some short dry time in-between. This helps the glitter to lay flat on the nail bed and avoid clumping of glitter in some places and balding in others. Since the glitter is so dense, thin coats are a must. I only needed two thin coats for full coverage. I suggest applying a thick topcoat over the polish to smooth out the surface and add some shine. I wish I had added a slightly thicker layer of top coat in my left hand, some of the glitter were not covered properly and started to lift up and pick off my the third day. This lead to me picking at it lol. I wish I could keep this on for longer! I thunk it is a great base for nail art or stamping. I will have to try it out next time before it starts to chip. I bought Pretty and Polished Jawbreaker and it isclose to what you have, check it out. I am loving polishes like this, I will definitely check that one out soon! I like this multi colour glitter!